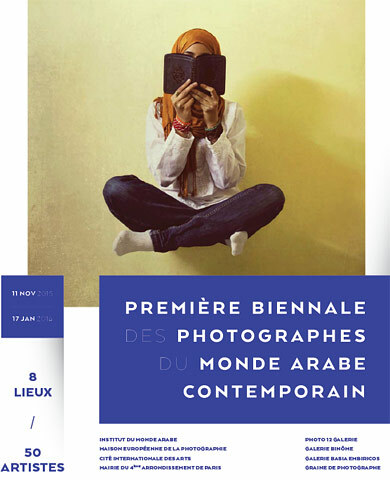 The Biennial exhibition of photography in the contemporary Arab world is a joint initiative of the Institut du Monde Arabe (the Arab World Institute) and the Maison Européenne de la Photographie (MEP). The first edition of the Biennial will provide a unique overview of the contemporary photographers who have been working in —or whose work has involved— the Arab World since the beginning of the 2000s. Based on the complementary expertise of the Institut du Monde Arabe and the Maison Européenne de la Photographie, the event will be held in these two major institutions, which are located near each other and are separated by the Seine. On both banks of the Seine, the IMA and the MEP will constitute the two main geographic locations of an itinerary in which visitors will discover several exhibitions, presented in private galleries and public venues associated with the event (the Cité Internationale des Arts, the Mairie of the fourth arrondissement, the Graine de Photographe Association, the Galerie Basia Embiricos, the Galerie Photo 12, and the Galerie Binôme). The Biennial will bring together works created by artists from Arab countries complemented by the work of Western photographers: different visions of a diverse and living region of the world, whose influence extends well beyond its borders. The aim of this Biennial is to become a major event in the contemporary photography scene. For the first Biennial exhibition of photography in the Arab World, the IMA has chosen to present a collective exhibition. Entitled ‘Histoire(s) contemporaine(s)’ [Contemporary History(ies)], it highlights the work of thirty experienced and emerging photographic artists, who have focused in a particularly pertinent way on an issue or theme associated with this vast geographic area. The artists in question, who originate from Arab and European countries, are highly mobile. They have a strong need to be involved first hand with their subject matter and train their lenses wherever they wish, and do not hesitate to step outside familiar territory. Avoiding any attempt to provide a completely comprehensive overview or highlight specificities that are likely to characterise the art of photography in Arab countries, the exhibition places emphasis on the visions of the photographers: Mehdi Medacci and Lazare Djeddaoui in Syria, Amélie Debray in Palestine, Diana Matar in Libya, and Hicham Gardaf in Tangier are more than just observers. They are deeply involved with their subject matter and prefer to produce a series of images rather than a single work. Their images reflect the recent political and social history in Arab countries, and contain all the associated changes and contradictions. Hence, the general public will discover the wealth and diversity of the viewpoints of these artists, who work within and outside the Arab world. Creating a veritable visual language and observing the world from a distance, they reflect the contemporary trend in photography, which combines art with a documentary approach. Through various themes such as Paysages, Intérieurs, Identités, Mémoires et récits, the works in this exhibition evoke both the history of photography and the history of individuals and societies. Mohamed Abusal, Jananne Al-Ani, Farah Al Qasimi, Tamara Abdul Hadi, Myriam Abdelazi, George Awde, Faycal Baghriche, Nabil Boutros, Christian Courrèges, Amélie Debray, Lazare Mohamed Djeddaoui, Anne-Marie Filaire, Hicham Gardaf, Lamya Gargash, Samuel Gratacap, Tanya Habjouqa, Emy Kat, Joe Kesrouani, Yazan Khalili, Amine Landoulsi, Diana Matar, Mehdi Meddaci, Amr Nabil, Malik Nejmi, Khalil Nemmaoui, Giulio Rimondi, Mouna Saboni, Steve Sabella, Wafaa Samir.